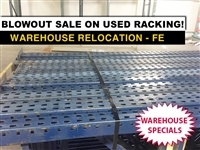 West Coast Shelving, your premier Bay Area used warehouse storage equipment outlet, is having a blowout special on some great discounted storage racking in a wide variety of sizes. This includes hundreds of load beams and uprights in many different lengths that are priced at such fantastic discounts that this is your perfect opportunity to add to your current warehouse shelving system or to begin building your first setup. 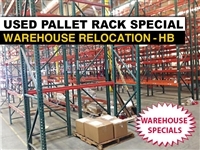 You won't find a better deal on affordable pallet racking components anywhere, as these specials include both used products and overstock that's put together in packages and sold at huge discounts from what you'd normally expect to pay for such high-quality products. Buy now and save! Used Pallet Rack Blowout Sale!